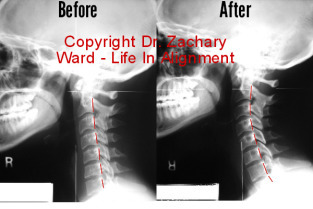 Does neck alignment matter in torticollis? Below is a story of Baby M who is currently undergoing care to improve her neck and body alignment to see if it will help her torticollis. Not long after birth some babies develop a tilt of the head toward the right or left shoulder, and a rotation of the head away from that same shoulder. (See the historic image). Many are diagnosed with congenital torticollis (fibromatosis colli), and it’s determined that the position of the head is locked due to a sudden and permanent spasm and scarring of a neck muscle called the SCM (sternocleidomastoid). Baby M after her first upper cervical adjustment (right). Historic drawing of torticollis in a child (left). Baby M arrived at Life In Alignment with a torticollis diagnosis, confirmed with testing that her right SCM had a lump of scar tissue that was forcing the muscle to contract. I could feel it. Mom could feel it. The pediatrician could feel it. You could pick it up with your fingers and roll it around. Her head was tilted to the right and rotated to the left. She had difficulty rotating her head to the right or looking straight ahead. As a result of sleeping with her head rotated to the left, and head tipped right, she started showing signs of distortion in the skull. Some are told to wait it out to see if the spasm and scar tissue spontaneously lets go…And some do let go. But others end up in surgery. Prior infant patient showing C-Shape of mild birth trauma. When I examined Baby M, she was very tight below her right jaw and behind her right ear. That tension traveled down to her right upper chest, and right upper back. There was a lot of resistance when trying to rotate her head to the right. She showed the posture of many babies with mild birth trauma: she would not lay relaxed and straight with her knees slightly apart. Rather, she would hike up her right hip and pull down her right shoulder and lay in C-shape toward her right, head rotated left. Whenever she was straightened out of this position, she immediately returned to it. Light pressure with guided movements of my hand released Baby M below her right ear at her upper neck. Very, very gently. She was then turned over to the other side, and a light release was accomplished on her left skull. Immediately she relaxed out of the C-shape, and she even rotated her head to the right for a moment. The test would be to see if the muscle bundle in her SCM began to relax over the coming weeks. The following day Mom texted to let me know that Baby M slept all day. Not usual for her! A good sign of healing. Releasing the restricted shoulder after the neck relaxed. Baby M came back a few days later and caught me by surprise on how quickly the muscle responded. The obvious muscle bundle you could feel and even pick up and roll around in your fingers had begun to let go. The SCM was relaxing. It was still present, but it was remarkably less. The only thing different Baby M had experienced in the prior day was to have her upper cervical spine balanced. Baby M was no longer laying in the C-shape to the right, but was willing to relax on her back, legs balanced, knees slightly apart. With the constant contraction of her right SCM and head tilt, I found her upper shoulder was locked on the front and back. She had plenty of mobility in her left shoulder, but clearly showed resistance in her right. Baby M was laid on her belly and her right upper thoracic spine was gently released with a sustained hold and then a tap of an instrument. Now her thoracic spine was moving again. Baby M will continue to receive some PT to help her brain reconnect with her right shoulder since the muscle was contracted for so long. Mom just let me know that the pediatrician confirmed that the scar tissue is getting softer and is already half its size. This is good. It appears that Baby M is on the road toward a “spontaneous” resolution of her torticollis with a little bit of help from some friends.